I've found my travels over the years have often started from a phone conversation or unusual thing seen in a paper or web site. This trip to Ozark National Forest and the mountains there started off from a conversation with a friend many years ago to get together and enjoy some hiking. Interestingly enough, during my time as an army officer I'd been part of a nighttime parachute jump with my unit and then went through an exercise in the training center that used to be at Fort Chaffee...so now I had a chance to hike in the Ozark Mountains that I'd done many a decade ago! To the image now...having little knowledge of places to explore or see, I decided to get on Flickr and see what I could find that others had captured in this area. One of the most beautiful locations was Hawksbill Crag or Whitaker Point. 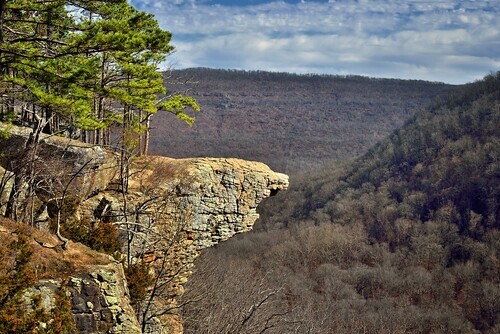 Not long after landing at the Fayetteville area airport, a friend and I headed down to this national forest to enjoy a stroll in the woods to see this famous point. This was one of the nearer viewpoints that seem to capture that point as well as some of the Boston Mountains off in the distance. Yes, there weren't vibrant green colors that one might see in spring or autumn, but it was a pretty nice view of the mountains and the blue skies with the clouds above! What I imagined for this image was a person sitting on the outcropping itself and taking in a view of the mountains and hillsides all around, and perhaps contemplating or just silently sitting and appreciating a beautiful view.